The emblems of Alberta reflect the province’s history, its natural and diverse landscapes, and its people. do not use the emblems to imply support, accreditation or approval from the Government of Alberta. of Arms is also used by the Court of Appeal, the Court of Queen's Bench, the Provincial Court and Provincial Judges. The original Coat of Arms was assigned by Royal Warrant in 1907. In 1980, it was augmented with a crest, supporters and a motto to create what is now known as the Alberta Coat of Arms. A minor revision was introduced in 2008 to replace the gentlemen's helmet with the royal helmet. Coat of Arms was adopted on July 30, 1980, by Royal Warrant. All requests to use the Coat of Arms must be authorized by the Minister of Culture and Tourism. The shield of the Coat of Arms was adopted as a separate official emblem known as the provincial shield in September 2013. Topped by a red St. George's Cross on a white background, the Provincial Shield features azure (blue) in back of a range of snow-capped mountains with green hills, prairie and a wheat field in front. The provincial shield remains as an element of two other emblems: the Coat of Arms and the flag of Alberta. Beginning September 9, 2013, images of the provincial shield became available for Albertans to download. Members of the public will be able to use the provincial shield without restriction or permission, as long as the image is not altered. Download the files for the Provincial shield. The shield is available in both a full-colour format and black and white format. Download the files for the Alberta flag. The flag is available in both a full-colour format and black and white format. The Franco-Albertan flag, created in 1982, is Pantone blue 648 UP, white and Pantone rose 1935 UP, with the fleur-de-lis symbolizing the Francophonie, the stylized wild rose and the blue representing Alberta, and the two oblique blue and white bands that traverse the flag representing the waterways and routes used by the explorers and early settlers. Créé en 1982, le drapeau franco-albertain est bleu Pantone 648 UP, blanc et rose Pantone 1935 UP; il est orné d'une fleur de lis qui rappelle la francophonie, d'une églantine stylisée et du bleu qui représente l'Alberta, et de deux bandes obliques bleue et blanche qui traversent le drapeau et représentent les routes et les cours d'eau qu'ont empruntés les explorateurs et les colons. Download the files for the Franco-Albertan flag. 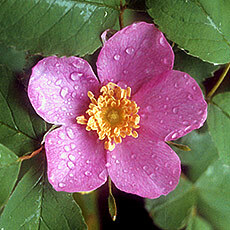 The wild rose was designated the floral emblem of Alberta in 1930. It grows almost everywhere in the province, brightening the countryside with flashes of pink. 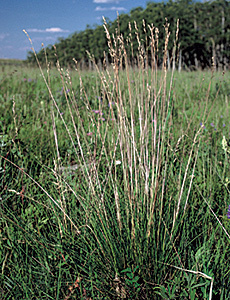 efforts of the Prairie Conservation Forum. The colours of the Alberta tartan represent the green of our forests, the gold of our wheat fields, the blue of our clear skies and sparkling lakes, the pink of our wild rose, and the black of our coal and petroleum. The tartan was designed by the Edmonton Rehabilitation Society for the Handicapped, now Goodwill Industries of Alberta, and was adopted as the official tartan of Alberta in 1961. 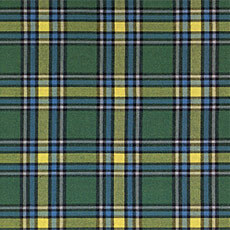 Download the files for the Alberta Tartan. Adopted in 2000, the Alberta dress tartan complements the Alberta tartan and can be worn for dancing, special occasions and formal attire. It includes the same colours as the Alberta tartan and adds large sections of white, a symbol of Alberta’s bright snowy days. 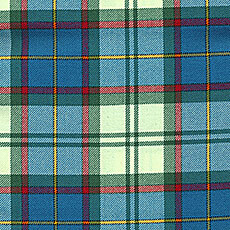 Download the files for the Alberta Dress Tartan. 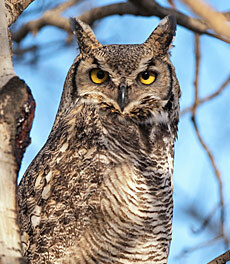 On May 3, 1977, the great horned owl was adopted as Alberta’s official bird after a province-wide children’s vote. The bird is a year-round resident of the province. Commonly found in gravel pits throughout Alberta, petrified wood is the result of the deposit of microcrystalline quartz in the pores and cells of the fallen trees of the Cretaceous and Paleocene times, some 60 to 90 million years ago. Petrified wood was recognized as Alberta’s official stone in 1977 due to the efforts of the Alberta Federation of Rock Clubs. 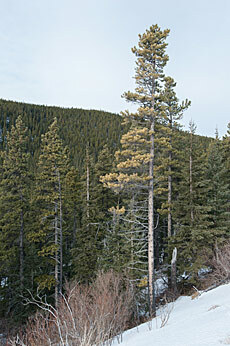 In the early 1900s, lodgepole pine was primarily used to make railway ties. Today it plays a major role in Alberta’s forest industry and is manufactured into poles, posts, pulp, plywood, mine timbers and other lumber products. It was adopted as the official tree of Alberta on May 30, 1984, due to the efforts of the Junior Forest Warden Association of Alberta. Alberta blue and Alberta gold are the official colours of Alberta and were adopted in 1984. The blue represents the sky and the gold/deep yellow represents the prairies. On August 18, 1989, the Rocky Mountain bighorn sheep was designated the official mammal of Alberta. The bighorn is a native Alberta animal. Prehistoric remains have been found in most of the river valleys across Alberta, showing that at one time some of the largest herds of Rocky Mountain bighorn sheep roamed the province. 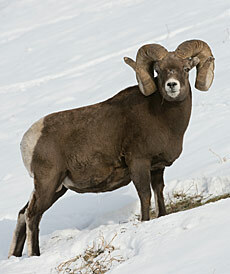 Today the bighorn is primarily found in the Rocky Mountain region. 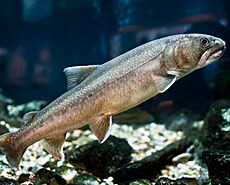 Adopted as the official fish of Alberta on May 2, 1995, the bull trout is one of eight species of trout found in the province’s glacial waters. In order to ensure Alberta’s population of bull trout never becomes endangered, there is a catch and release policy governing all bull trout fishing in the province. In addition to the designated official emblems, Alberta also has a provincial song titled Alberta which was adopted in September 2004. It pays musical tribute to the province's geography, industry, history and cultural diversity. Alberta was composed by Mary Kieftenbeld as part of a contest to find an original, official song for the province's centennial celebrations in 2005.
their own students and/or ensembles. These arrangements are not for commercial use or resale.